While the Final Fantasy series holds a special place in my heart, there’s room in there reserved for Grandia as well. It was the first JRPG I played that wasn’t Final Fantasy. I played it in German, didn’t understand a big part of it, but loved it anyway. Why? The story in Grandia is simple, full of tropes and clichés, but it remains charming and fun to go through. You pretty much expect things to happen, but you like it anyway. There’s a young boy who dreams of adventures, a big, bad, but humanized force in the form of a military group lead by a general, a rag-tag group of friends that assemble around the protagonist and even a secondary bad guy who turns out to be a good guy. There’s plenty of twists, turns and happenings, but most of them are sort of expected. Back in the day, the sound was the strong point of the PlayStation remake of Grandia. Why? Because it was one of the first JRPGs that had actual voice acting. Even by standards back in the day, it was mostly bad voice acting, especially with Justin, the main character, but it was still voice acting. The fact that the game hat it at all was absolutely amazing. 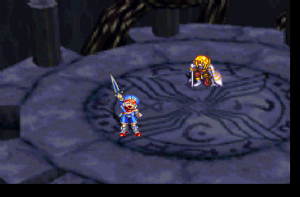 So, the acting isn’t very good, but it’s there, it works and it adds a lot of charm to Grandia. Just to paint a picture on how important this feature was – one of the main advertising points for Final Fantasy X, a PlayStation 2 game, was that it was fully voice acted. The music in Grandia shouldn’t be forgotten either. It’s actually quite amazing, on par with the better work of Nobuo Uematsu if you ask me. The Title song, the End of the World theme and the three battle themes are probably the best in the bunch, but we can’t forget A Farewell to Sue either. 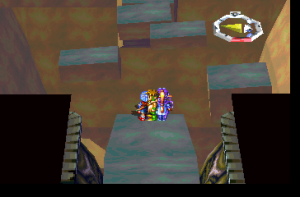 Overall, Grandia is not an extremely pretty game, unless you look at the details. It’s in the details that the game shines. The environments are almost completely 3D and there’s a huge amount of interactive elements. Some of these are just flavor, such as knocking over pots, but some of them actually add to the game, enabling you, for instance, to change the layout of dungeons, trigger traps, etc. A lot of puzzles in the game use switches to open up paths within the dungeon. This is just a regular scene at the end of a bigger battle. The sprites look great at all times. In battle, we can see how the 2D sprites are nicely animated. There’s a multitude of poses and moves the characters can do, and they all look great. Each and every battle screenshot I took while replaying Grandia looks great, kind of like a strange, stylish drawing. That is, each and every that wasn’t completely covered in spell effects. Don’t get me wrong, it’s not that the spell effects look bad, it’s just that they are more suited for dynamic presentation, not a still image. The sprites, on the other hand, constantly look great. The character system is simple to understand, but there’s a lot of stuff you can unlock and grind for. There’s a total of six equipment slots – weapon, hands (shield or glove), head (helmet, tiara, ribbon), feet, armor and accessory. Each of these can be fitted by an item that increases your stats but can also add a special effect, such as reducing skill costs, or adding extra attacks. Parts of the environment are constantly shifting, opening up new pats, creating dangers, etc. 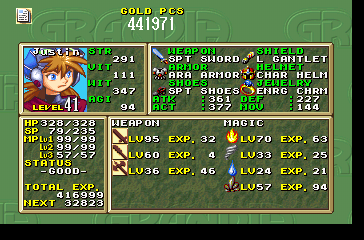 Each character in Grandia also has a set of weapon skills and up to four magical elements. Each of these gain levels on their own, simply by being used. To unlock a spell or a skill, you need a certain amount of levels in the respective weapon skills or magical elements. In addition to that, raising skill and spell levels increases attributes, which is different for each character. While this means that most characters have a specific role to play (Justin is strong overall, Feena is an agile spell caster, etc. ), if you invest the time, you can pretty much max everything, since there’s plenty of levels and stat gain items to do just that. This is the status screen of Justin. It seems simple, but each of those stats can be directly affected. 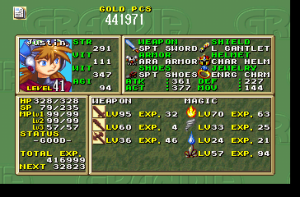 The battle system in Grandia is fast, there’s very little getting in the way, but it’s still very engaging and complex. There are regular attacks you can do, which usually hit twice, unless you have specific items you can equip. There are also critical attacks, which are used once, take longer to charge up and hit harder, but also stun the enemy for a moment and can even cancel their action if you hit them at the correct moment. Finally, there are skills and spells. Skills cost SP, and spells cost MP. There are three levels of spells and each uses their own MP pool. The charge up speed of skills and spells is affected by weapon and magic skill levels, as well as regular usage of spells. It’s indicated by a certain number of stars. This isn’t the end of it, though. You can also defend in Grandia. There are two types of defending – Endure and Evade. Selecting “Endure” simply reduces incoming damage. Selecting “Evade” allows you to re-position your character on the field. Yes, positioning exists and it can get quite important. A lot of bosses and enemies use area magic, so proper positioning can be the difference between having to heal on each turn and not having to heal at all. Positioning is also important in attacking. Each character has a movement stat which decides how far they can move on the battlefield. If you target an enemy out of reach, you can actually waste your action if your movement isn’t high enough. Finally, there’s also Auto-Battling. You can assign a type of AI to each individual character or to the entire group and fully automate the fight. The AI isn’t perfect, but this can be very useful when you want to watch a movie and mindlessly grind for a bit. You can set your characters to just attack, use status spells, use their strongest moves, etc… You just need to be careful when to use this because a lucky confuse on Justin can kill your entire party. Grandia is too easy. I remember it feeling much harder when I played through it as a kid, so that probably plays a big role in it, but there was hardly any challenge on my recent playthrough, even during the extra difficult optional areas. That, and the voice acting can be truly awful at some points, especially with Justin. I know a lot of people hate on Sue, but I actually find her adorable. It’s Justin that I have a problem with, sometimes. Even Mullen has way more cool moments than Justin. The difficulty can be amended, though. Thanks to /u/Fa1nT of reddit (go and upvote him), I found out today that there’s Grandia ReDux. Grandia ReDux is a fan modification of Grandia which tweaks almost everything about it, making it slightly different, much more challenging, but also much more rewarding. I’m not sure if it delivers, or if just turns the game into a grind, but I’ve heard good things about it. By the way, googling for this just now, in order to get more information, made me find another site – Insane Difficulty. From what I can gather, it’s a message board for modifications to various games which serve to increase their difficulty. They also discuss various inherently difficult games and game challenges. Good stuff! Grandia is a great game. It was great back in the day, and it’s great now. As far as overall quality goes, it’s on par with any older Final Fantasy, not considering the budget area. With newer Final Fantasy games, there’s no competition at all. If you like JRPGs, you need to play Grandia.